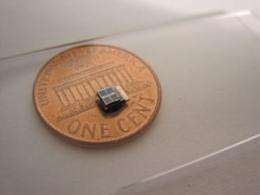 (PhysOrg.com) -- A 9-cubic millimeter solar-powered sensor system developed at the University of Michigan is the smallest that can harvest energy from its surroundings to operate nearly perpetually. The U-M system’s processor, solar cells, and battery are all contained in its tiny frame, which measures 2.5 by 3.5 by 1 millimeters. It is 1,000 times smaller than comparable commercial counterparts. The system could enable new biomedical implants as well as home-, building- and bridge-monitoring devices. It could vastly improve the efficiency and cost of current environmental sensor networks designed to detect movement or track air and water quality. With an industry-standard ARM Cortex-M3 processor, the system contains the lowest-powered commercial-class microcontroller. It uses about 2,000 times less power in sleep mode than its most energy-efficient counterpart on the market today. The engineers say successful use of an ARM processor— the industry’s most popular 32-bit processor architecture—is an important step toward commercial adoption of this technology. Greg Chen, a computer science and engineering doctoral student, will present the research Feb. 9 at the International Solid-State Circuits Conference in San Francisco. The sensor spends most of its time in sleep mode, waking briefly every few minutes to take measurements. Its total average power consumption is less than 1 nanowatt. A nanowatt is one-billionth of a watt. The developers say the key innovation is their method for managing power. The processor only needs about half of a volt to operate, but its low-voltage, thin-film Cymbet battery puts out close to 4 volts. The voltage, which is essentially the pressure of the electric current, must be reduced for the system to function most efficiently. “If we used traditional methods, the voltage conversion process would have consumed many times more power than the processor itself uses,” said Dennis Sylvester, an associate professor in electrical and computer engineering. One way the U-M engineers made the voltage conversion more efficient is by slowing the power management unit’s clock when the processor’s load is light. “We skip beats if we determine the voltage is sufficiently stable,” Sylvester said. The designers are working with doctors on potential medical applications. The system could enable less-invasive ways to monitor pressure changes in the eyes, brain, and in tumors in patients with glaucoma, head trauma, or cancer. In the body, the sensor could conceivably harvest energy from movement or heat, rather than light, the engineers say. The inventors are working to commercialize the technology through a company led by Scott Hanson, a research fellow in the Department of Electrical Engineering and Computer Science. "The system could enable new biomedical implants"
"Our system can run nearly perpetually if periodically exposed to reasonable lighting conditions, even indoors"
I doubt it would be exposed to reasonable light if it's implanted in the body; or am I missing something, like a sunroof. Imagine eye implants that are solar powered. Imagine hearing aids that are solar powered. Imagine a pace-maker or robotic prosthesis powered by a solar celled hat or jewelry. So those are just solar, and within reason. Imagine nano- scale medical robots that use latent excess chemical energy from the patient's body to power themselves while they perform nano-scale surgeries, kill pathogens and cancers, repair bone damage, etc. inside the eye perhaps, or just below the skin? if they can get it to run on bodyheat than it could operate anywhere in the body, stirling concepts would be rather difficult as you need a temperature gradient difference accross an interface (such as top of skin with ambient air, wich prohibits use deeper inside body), but perhaps infrared capture cells could operate deep inside..
How about pacemakers that are powered by EM Fields as opposed to pacemakers that stop functioning when exposed to EM fields. That alone would be a huge breakthrough. No more chasing the elderly away with Microwaves.